Because of the technology we use, we are able to make our undergarments very slim and lightweight. They are made to look and feel like regular underwear. The outer layer is a cotton and elastane. There is a soft .microfiber liner, an absorbent polyester interior and a supple polyurethane laminate waterproof layer which is not only breathable but will remain cool and comfortable. Is there anything I can use to help me and my child during Potty Training? 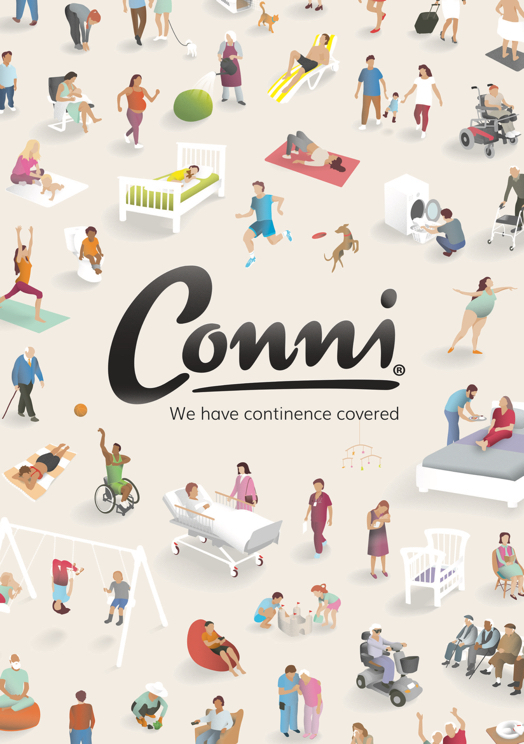 As well as our Tackers being a great aid during Potty Training, our CONNI Potty Training Kit contains a bright and colourful CONNI poster, smiley stickers, CONNI Kids achievement certificate, tips and advice for parents. Whilst the CONNI Swim Shorts will fully contain any bladder and bowel matter, we do not recommend prolonged wear after an accident has occurred. For good hygiene, we recommend making your way to the nearest change room and cleaning up. Yes. They have the same four layer technology as the CONNI Bed Pad, they are just a smaller version that’s perfect for sitting areas. If you have dexterity problems or just need a waterproof barrier, you should choose the CONNI Toggle Mattress Protector. They fit easily to the mattress by tightening a toggle on each corner, meaning no struggling with an elastic fitted sheet.They are not absorbent and don’t have the soft top layer, so would recommend using this under normal bedding. While we would not recommend the CONNI Kids undergarments as a replacement to diapers, our Kids range is a great choice if your child has Light Bladder Leakage (LBL) or when your child is potty training. We all know accidents happen, and our tackers are perfect for someone not getting to the toilet in time, waking up too late, or not emptying their bladder completely. Please contact us on 904-880-9900 to discuss and we will do everything we can to resolve your issue. You have peace of mind knowing all our products have warranties under the Australian Consumer Law (ACL).